Acute hematogenous osteomyelitis (AHO) occurs primarily in children and is believed to evolve from bacteremia followed by localization of infection to the metaphysis of bones. Currently, there is no consensus on the route and duration of antimicrobial therapy to treat AHO. 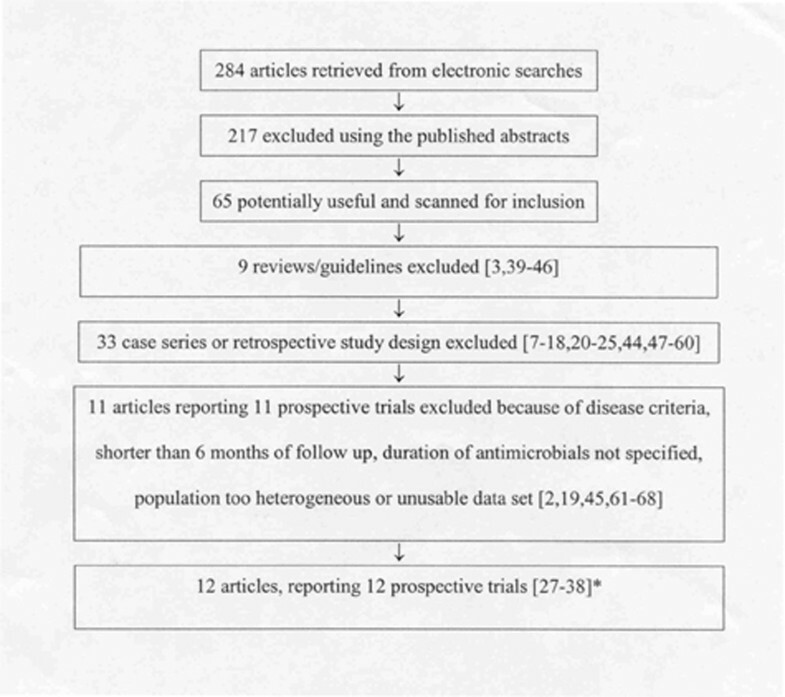 We conducted a systematic review of a short versus long course of treatment for AHO due primarily to Staphylococcus aureus in children aged 3 months to 16 years. We searched Medline, Embase and the Cochrane trials registry for controlled trials. Clinical cure rate at 6 months was the primary outcome variable, and groups receiving less than 7 days of intravenous therapy were compared with groups receiving one week or longer of intravenous antimicrobials. 12 eligible prospective studies, one of which was randomized, were identified. The overall cure rate at 6 months for the short course of intravenous therapy was 95.2% (95% CI = 90.4, 97.7) compared to 98.8% (95% CI = 93.6, 99.8) for the longer course of therapy. There was no significant difference in the duration of oral therapy between the two groups. Given the potential increased morbidity and cost associated with longer courses of intravenous therapy, this finding should be confirmed through a randomized controlled equivalence trial. Acute hematogenous osteomyelitis (AHO) occurs mainly in children and is more common in males [1–3]. AHO is believed to evolve from bacteremia followed by localization of infection to the metaphysis of bones. Successful treatment of AHO is crucial for the prevention of morbidity and functional loss of the affected limb. Currently, there is no consensus on the route and duration of antimicrobial therapy to treat AHO. The suggested duration of intravenous therapy ranges from 3 days to 4 to 6 weeks. One general pediatric textbook describes 7 days of parenteral therapy as standard,  whereas a pediatric infectious diseases textbook states that the usual duration of therapy is 4 to 8 weeks with a change to oral medication permissible when signs of local inflammation has resolved . A standard orthopedic textbook suggests intravenous therapy for 5 days followed by oral therapy for 4 to 6 weeks for "typical" cases . Given the paucity of randomized controlled trial evidence to guide clinicians in the management of children with AHO, they have typically relied on data presented in observational studies. The vast majority of these studies have used a cohort design. Here, a group of children diagnosed with AHO are identified and treated using antibiotic therapy. The results are usually reported as successful response rates following a specified period of treatment (e.g., 14 days). Two studies, each including over 100 children, suggest at least 3 weeks of intravenous antimicrobial therapy for the treatment of AHO in children. In these two studies, success rates of 82% and 81% were observed in children treated with intravenous antibiotics for less than 21 days [7, 8]. There is, however, wide variation between studies regarding failure rates according to treatment duration. A series of smaller studies quoting 1 to 52 days of parenteral antimicrobial therapy have reported success rates ranging from 81% to 100% [9–25]. The aim of our systematic review was to determine whether short courses (less than 1 week) of parenteral antimicrobial therapy show equivalent cure rates compared with longer courses (greater than 1 week) in children with AHO caused primarily by Staphylococcus aureus. Studies were included if they involved children between 3 months and 16 years of age. The clinical criteria used for the diagnosis of AHO was: (a) positive culture of Staphylococcus aureus from bone or periosteum; or (b) clinical signs of osteomyelitis and a concurrent positive blood culture; or (c) clinical signs and a compatible radiological study (nuclear scan or radiography). Clinical signs were to include swelling, warmth, tenderness and decreased ability to weight bear. The study design had to meet 3 eligibility criteria: 1) the study had to be prospective cohort; 2) the intervention had to identify the antimicrobial and its route (parenteral or oral) and duration of therapy; and 3) the outcome after an average of 6 months of follow up had to be stated or inferable as clinical cure, failure or relapse. Titles and abstracts of each citation were downloaded to a reference database. Two authors (NLS, AH) independently screened each citation to determine whether to retain it. Potentially relevant citations were retrieved and then subjected to a relevance assessment using our eligibility criteria. Open consensus was used to settle differences. Once a study met the inclusion criteria, two members of the research team (NLS; AH) independently abstracted data using structured data abstraction forms. We captured information about the report (e.g., language of publication), design (e.g., cohort), population (e.g., diagnosis), intervention (e.g., type of antibiotic), and primary outcome (e.g., response rates). If more than one cohort was present in a study, data from each cohort was abstracted separately. Disagreements were resolved by consensus. Treatment of seven days or less of parenteral therapy was considered short course. In many institutions the, typical time required for defervescence, observation, and arrangement of follow-up is about seven days. We thought that this was a practical point at which to dichotomize for the purposes of analysis. When all children are cured, normal theory based confidence intervals for the proportion cured are unavailable, and when cure rates are close to 100%, normal theory based confidence intervals may provide poor approximations. To overcome these problems, Wilson score confidence intervals were computed . Under the hypothesis of homogeneity of cure rates across cohorts, a fixed-effect estimate of the overall cure rate is provided by the total number of cured patients divided by the total number of patients. The same estimate is provided by an intercept-only logistic regression model. To test the homogeneity of cure rates, the residual deviance from the logistic regression model was compared to a chi-square distribution with degrees of freedom given by the number of cohorts minus one. Cohorts with different treatments within the same study were analyzed as separate parallel groups. The difference between the overall cure rate under short- and long-term parenteral antimicrobial therapy was assessed using a z-test. Using the same methods, we performed a sub-group analysis comparing overall cure rates for beta-lactams and macrolides. The difference in mean length of oral therapy for cohorts that had short- and long-term parenteral antimicrobial therapy was assessed using a t-test. Unlike parallel-arm studies, where selective publication of statistically significant results may produce publication bias, quite different publication issues may apply to single-arm cohort studies. The funnel plot, often used to assess publication bias, is therefore not relevant in this review. A flow diagram of the search results is illustrated in Figure 1. Two hundred and eighty-four articles were identified initially. Of these, 57 articles were considered potentially relevant. Of these, 34 were small or mixed case series or had a retrospective study design. 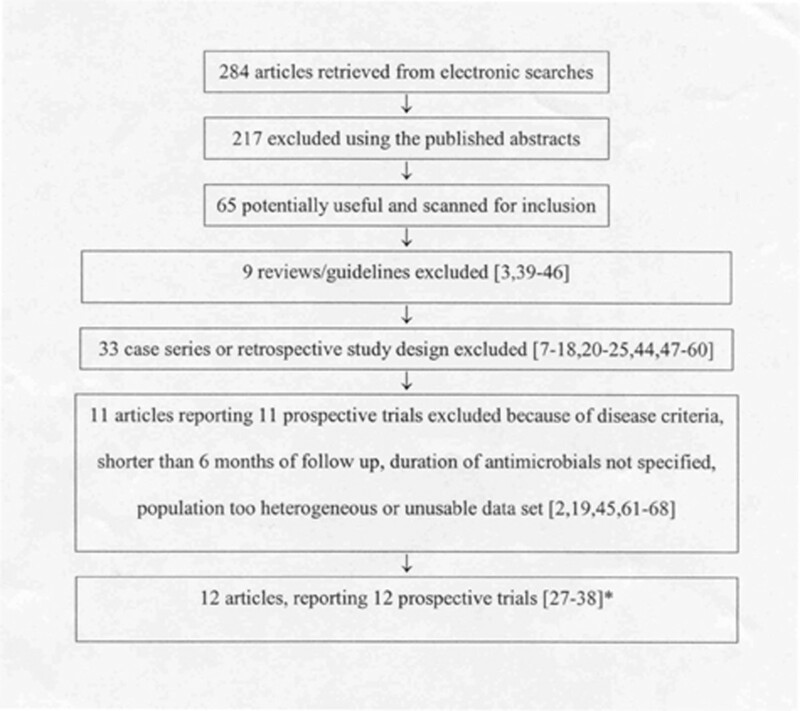 Of the remaining 23, 11 studies that appeared to be prospective cohorts had either unusable data, short follow-up or the duration of antimicrobial could not be discerned from the data presented (Table 1). Of the remaining 12 studies, 11 that were of a prospective design were included in the systematic review [27–37]. In some cases, only a subset of patients were eligible for inclusion (see notes in Table 2). We excluded one study of 25 children  as it was a different study architecture. It is inappropriate to combine estimates of effectiveness (i.e., cure rates) from different study types. Flow diagram outlining the results of literature search and review of studies retrieved. Mainly epidemiologic data. Appears to be the cohort from which Peltola 1997 is drawn. Small prospective cohort of 4 patients evaluating teicoplanin. Study addressed bactericidal titers. Follow-up did not extend to 6 months although reported cure rate was 95% with an average duration of 5 days of intravenous antimicrobials. Addressed the use of pristinamycin orally. Data was not usable because group could not be reliably separated for route and type of antimicrobial. No follow-up data available. Trial focussed on microbiology and side effects of treatment. Data on osteomyelitis cases alone could not be extracted. Maximum follow-up was about 4 months. Cure appeared to be 95% with mean duration of IV antibiotics of 13.7 days. Follow-up was 4 months. Mean duration of intravenous antimicrobials in 14 children was 4.21 days (range 2–21 days) and cure was 100%. Group of osteomyelitis and septic arthritis could not be separated with respect to length of therapy or etiology. Only 3 cases of osteomyelitis due to S. aureus. Of 9 children only 1 child had osteomyelitis alone. No follow-up. Combined patients with septic arthritis and osteomyelitis. Could not extract data with respect to S. aureus alone. 1 Includes cases that were due to Staphylococcus aureus and those who were culture negative 2 Included only the cases that had osteomyelitis alone or had contiguous arthritis and osteomyelitis. 3 Estimated value. 4 Clindamycin is the only macrolide studied – all other antimicrobials mentioned are beta-lactams. 5 Median reported. 6 Only the 6 patients who clearly met the diagnostic criteria were included. 7 Data abstracted from the 11 cases of osteomyelitis (8 of whom had S. aureus). 8 Only data for the 18 children with acute osteomyelitis from the study were included. Some of these may only have received oral medication. 9 Data from the 48 patients for whom there was follow-up of greater than 6 months. The 7 cohorts that had less than 7 days of intravenous therapy (n = 146) had a pooled cure rate of 95.2% (95% confidence interval: 90.4, 97.7) [28–32, 35, 37]. There was no significant heterogeneity among their cure rates (chi-square= 8.2 on 6 df, p= 0.224), indicating that the variation in cure rates could be attributed to sampling error. The 5 cohorts who had a duration of intravenous therapy of 7 days or longer (n = 84) had a pooled cure rate of 98.8% (95% confidence interval; 93.6, 99.8) [27, 31, 33, 34, 36]. 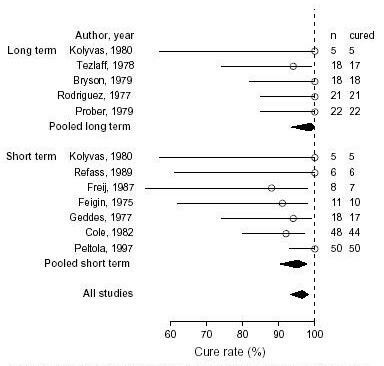 There was no significant heterogeneity among these cure rates (chi-square = 3.1 on 4 df, p = 0.537). Pooling all of the cohorts regardless of duration of intravenous therapy, there was no significant heterogeneity among cure rates (chi-square = 13.7 on 11 df, p = 0.248). The fixed effects model gave a pooled cure rate of 96.5% (95% confidence interval; 93.3, 98.2). There was no significant difference in the cure rate between the two groups (z-test p-value 0.838). Comparing beta-lactams and macrolides, there was no significant heterogeneity within either group (beta-lactams; chi square = 7.3 on 7 df, p = 0.394. macrolides; chi square = 5.2 on 4 df, p= 0.159). The pooled cure rate for beta-lactams was 95.4% (95% confidence interval; 90.3, 97.9) under a fixed effects model. The pooled cure rate for macrolides was 98.0% (95% confidence interval; 93.0, 99.4). There was no significant difference in the cure rate between the two groups (z-test p-value 0.286). Since the total duration of antimicrobial therapy (i.e., parenteral plus oral) can affect the cure rate, we also looked at the duration of oral therapy. For the cohorts that had less than 1 week of parenteral therapy, the range of duration of oral therapy was 15 to 39 days with a mean of 32 days [28–31, 35, 37]. We could not reliably determine the mean number of days of oral antimicrobials from one study . For the cohorts that were given a longer duration of intravenous therapy, the range of duration of oral therapy was 18 to 56 days with a mean of 33 days [27, 31, 33, 34, 36]. There was no significant difference in the duration of oral therapy between the two groups (t-test p-value 0.888). Among the group who had short-term antimicrobials, the percentage of children that had surgery ranged from 30% to 'routine' or probably over 90% [28–31, 35, 37]. Two authors did not state the percentage of children who required surgery [29, 32]. Among the long-term group, the range is from 50 to 90% [27, 31, 33, 34, 36]. It was not stated explicitly in most cases whether these procedures were for diagnostic or therapeutic purposes. The number of children with septic arthritis in the short course group ranged from 0 to 40% [29, 31, 35, 37]. In three studies the exact number could be deduced, [28, 30, 32] whereas in the 5 cohorts who were given greater than 7 days of therapy, 0% to 20% of children had concomitant septic arthritis [27, 31, 33, 34, 36]. The epidemiology of childhood AHO has changed since routine childhood immunization against Haemophilus influenzae type b was introduced in the early 1990s . Currently, the most common causative organism of childhood AHO is Staphylococcus aureus. For AHO therapy to be successful, levels of antimicrobial agents must be maintained sufficiently high over time to eliminate the bacteria from the site of infection. Pharmacologic evidence for adequate concentrations of oral antimicrobial agents in affected tissues supports the use of oral agents within a management scheme of 'step-down therapy.' [34, 36] The benefits of shorter courses of parenteral antimicrobial therapy before switching to oral therapy include decreased costs and morbidity. There still exists, however, a dilemma with respect to the optimal duration of parenteral therapy. Our systematic review of cohort studies using a minimum follow up of 6 months found a pooled cure rate of 95.2% (95% CI = 90.4 – 97.7) with 7 days or less of parenteral therapy. Other cohorts that had short follow-up (therefore not included in our review) reported treating children with less than 7 days of parenteral antimicrobial reported cure rates of greater than 90%; [40, 41]. In one other cohort (not suitable for inclusion in our analysis due to unextractable data, heterogeneous group and a follow up period of 4 months), a 95% cure rate was observed with 14 days of parenteral antimicrobial therapy . 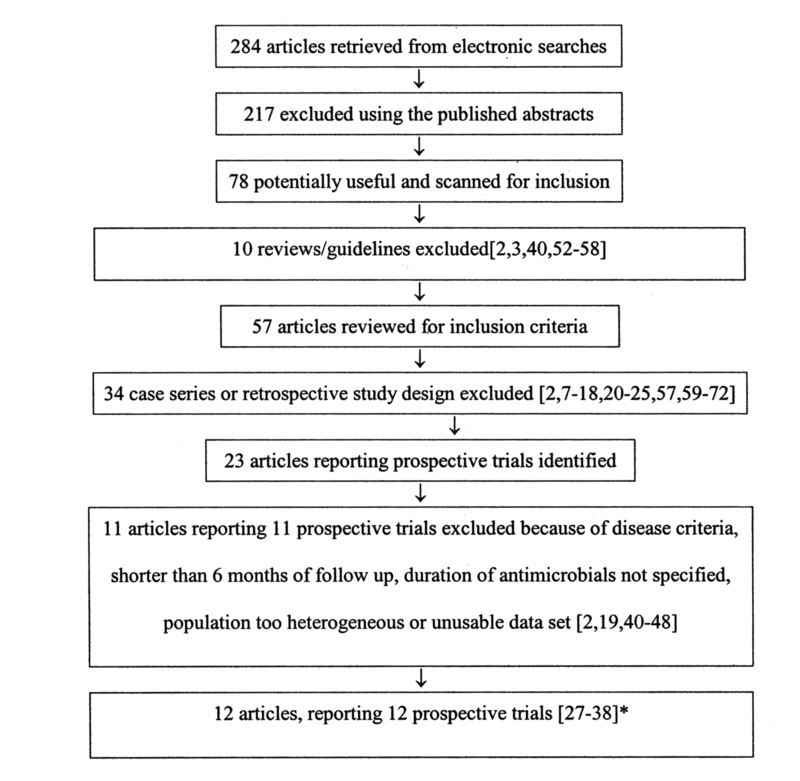 Many other prospective studies could not be included in the systematic review for a variety of reasons: lack of standardized definitions, lack of retrievable treatment information or short follow-up periods [2, 19, 40–49]. The small sample size used (mean of 24 patients; range 5 to 50 patients) is of concern although we gained statistical strength by pooling across studies. Thus, individual studies have wide confidence intervals, which are narrowed using the systematic review approach, providing a more precise estimate of the "true" cure rates (Figure 1). The range of duration of oral antimicrobial agents was also wide, implying that there may have been other clinical factors that were implicit in the decision of total length of therapy. Other clinical parameters, such as the extent of bone involvement, suspicion of septic arthritis and the course of the illness before treatment, may also have influenced treatment duration, but were not reported. Although the studies were prospective cohorts with respect to length of therapy they may be inherently biased in their selection criteria. We did not assess the quality of reports of the included studies. Quality assessment is an important part of a systematic review, particularly if a validated approach is used . We are unaware of any published assessment measure for cohort studies and elected to forgo the pitfalls of developing one ourselves . Clinical heterogeneity in the data from older studies can be partly attributed to the multiple pathogens that were responsible for the clinical syndrome. Only one study was published after routine childhood immunization for Haemophilus influenzae type b was introduced in the early 90's . We included children who had had disease due to Staphylococcus aureus as well as those who were culture negative because in many cases this reflects the reality of clinical practice. Studies that deal only with staphylococcal disease or that were published after 1990 from areas where there is universal immunization against Haemophilus influenzae type b are most likely to best represent the child who currently presents with AHO due to methicillin sensitive Staphylococcus aureus (MSSA). Our review had several limitations. We narrowed our focus to cohort studies. Results from randomized controlled trials may provide more valid results and we are aware of the existence of at least one such study . The cure rate of 91.6% in children who received short course parenteral therapy however supports the findings of this systematic review. This report however only included 12 children in that group. Combining this study with the cohort studies might introduce bias into the estimates of cure rates. Our results indicate that cure rates are similar regardless of whether children with AHO are treated for a shorter or longer time period. There are several potential practical advantages of the shorter course of therapy; shorter hospital stay; decreased morbidity from intravenous lines and more cost effective. We believe that the results from this systematic review warrant serious consideration be given to conducting a randomized controlled trial. Such a study could be developed to demonstrate equivalence between two durations of antibiotic therapy: a shorter course (i.e., 3–5 days) compared to a more "standard" course of 14 to 21 days. This would only be relevant if cure rates were not equivalent. The results from such a study could be used to better inform clinicians as to the management of children with AHO in the future. We would like to thank Dr. Barbara Law and for helpful comments on an earlier draft of this manuscript. NLS conceived of the study, participated in study design, reviewed trials for inclusion, abstracted data, participated in data analysis, and drafted the first manuscripts. AH participated in initial study design, reviewed trials for inclusion, abstracted data, participated in data analysis, contributed to writing of the manuscript. NJB planned and directed the statistical analyses, and participated in the drafting and revision of the manuscript. IG extracted data from trials, carried out statistical analyses, and participated in the drafting and revision of the manuscript. MS participated in the development of the literature search, interpretation of the results and preparation of the manuscript. DM supervised the systematic review and advised on methods issues.